Practice the "three complaint rule". 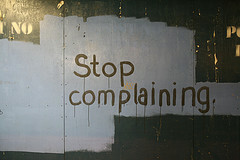 When it comes to complaining, you are allowed to complain about something three times. After that either change your attitude, change your behavior, accept the situation or move on (and stop complaining). Subscribe to an inspiring daily quote here.